There are an abundance of tools for organizing available on the market these days. Knowing where to spend your money can be a challenge. It’s not uncommon for people to invest in fancy organizers with good intentions of creating order. Instead, those products often end up adding to the clutter as they sit unused among the sea of items they were meant to contain. That’s because people get the process backwards. ​Instead of shopping for organizational products and then stuffing them with miscellaneous stuff, would-be organizers need to purge and sort before succumbing to the temptations elicited by the many tools for organization available. By sorting first and shopping second, organization-seekers arm themselves with much needed information. Knowing exactly what it is you want to store will help you choose the perfect container in which to store it. Sorting paired with purging reduces the amount of stuff that needs storing. Purchasing storage containers before you purge provides a false sense of order by encouraging you to hang onto things you may not really want, need, or use simply because you’ve got a box or bin to put it in. This section of the site is dedicated to finding and utilizing the ideal tools for organizing of your space. Here you will find tips on how to choose the perfect product to meet your needs as well as innovative ways of using tried and true organizational tools. For starters, let’s consider three key factors to keep in mind when selecting tools for organizing be it containers, furniture or wall-mounted storage. Organization and interior decorating go hand in hand. Each compliments the other. Good organization blends with the style and décor of a room, and good interior decorating includes an integrated plan for storage. Storage should be unobtrusive. It should feel like a natural element of the space. Interior decorating should be functional as well as beautiful. In order to achieve this ideal, choose storage that compliments and enhances your existing décor. As functional as plastic bins are, they’re not ideal for all types of storage. In addition to these staples (or perhaps in place of them) look for decorative yet functional baskets, bins, boxes, totes and buckets as well as furniture for storage. The level of durability needed for a given type of storage will depend on the items being stored and their location. Obviously, attic, garage, and outdoor storage need to be more heavy duty in nature than your typical living room storage. Also take into consideration the frequency with which stored items will be accessed. Containers that are used regularly will experience more wear and tear than those used for long term storage. Handles, lids and fasteners are particularly susceptible to damage given frequent use. Try to envision how the product will perform over time and make decisions accordingly. The user is another important factor to keep in mind when selecting storage. Toy storage, for example, should be forgiving as it is certain to take a good deal of abuse. In addition, it should be easy to open and close and light weight. Look for storage options that might be used in a variety of ways. This is particularly true for toys which will eventually be outgrown and replaced with other items. You want something that is going to maintain its usefulness and style for many years to come. 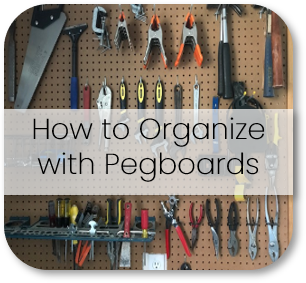 Containers are not the only type of tools for organizing. Versatility is important both for furniture as well as smaller storage pieces. Look for options that serve multiple functions or that will work well in more than one room.. When choosing tools for organization be sure to consider style, durability and versatility. The following pages feature some of my favorite tools for organizing. 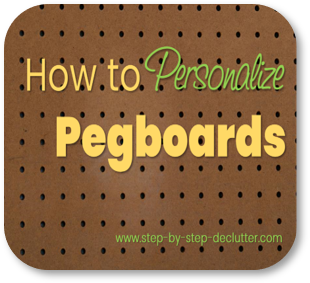 You'll also find tips for using tried and true organization tools in new and innovative ways.